As temperatures warm (oh please, temperatures, warm already, wouldya? ), booking vacation moves up on the priority list. If you’re thinking about a volunteer vacation, there are more options every day. For the past 35 years, the Adventure Center has prided itself on creating affordable active travel experiences around the world. There is a huge range of opportunities from tall ship sailing to African safaris, Antarctica voyages, cycling excursions, and a great bundle of volunteer vacation options. 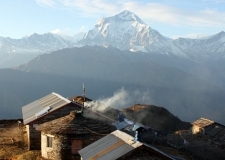 I’m a bit obsessed with Nepal and Bhutan right now, so I love the two Nepal trekking trips coming up where, in addition to being immersed in and exploring the culture of rural villages as well as big city Kathmandu, you will help improve and expand a school for hearing and speech impaired children. A Brazilian trip includes helping at a day care center…or restoration and teaching at a school in Thailand that had been struck by the 2004 tsunami…or assisting with a wildlife research excursion in the bush of South Africa, helping a science team track elephants, rhinos, lions, and more…sea turtles in Costa Rica…building fuel and energy efficient stoves in the Peruvian Andes…maintenance projects in a Vietnam rehabilitation center for children…vegetable gardens and wildlife conservation education along the Zambezi River…I want to do them all. 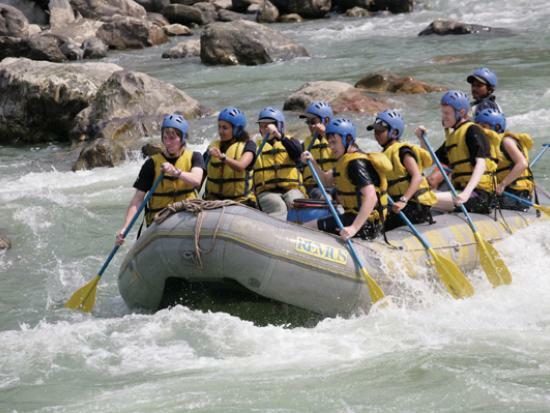 Since all work and no play makes Jack a dull boy, there is a balance with the volunteer efforts and great fun adventures with hiking and snorkeling and zip-lining and river rafting and cultural excursions and exploratory tours as the group moves through a destination, working not only deep, but wide as well. 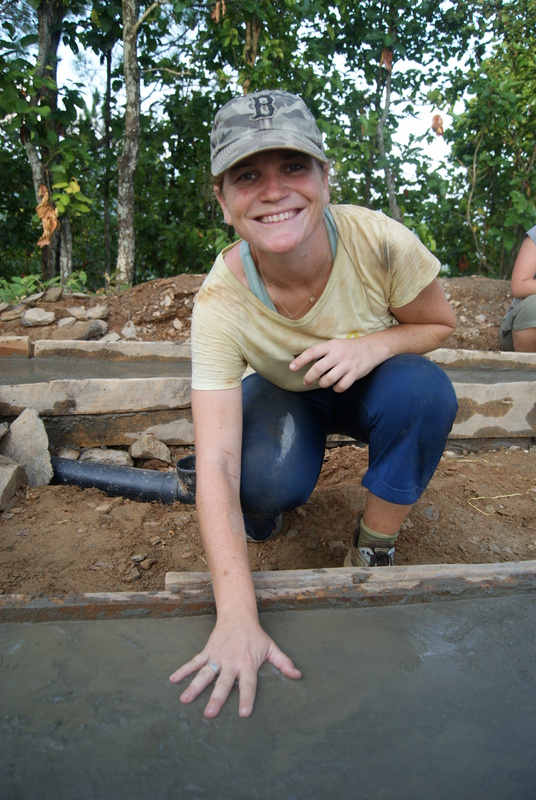 Erin believes in the potential of international service to foster global understanding between people and nations. She created Edge of Seven because she has worked with communities in need in the developing world. She has also met volunteers who want to serve in any capacity, big or small. Erin believes that Edge of Seven is an affordable vehicle to harness the potential in connecting the two. The mission of Edge of Seven is to create awareness and volunteer support for service projects in developing countries that are sustainable, community driven, and responsive to local needs. We at Edge of Seven believe that change is possible with collective action over time. Tell me a little bit about the genesis of EDGE OF SEVEN—why this? And what’s the scoop on that name? It really began years ago when I attended an info session about the Peace Corps. After learning that it was a 2 ½ year time commitment, I decided not to apply. I felt that I couldn’t go that far away, for that long, at that time in my life. I searched for a short-term alternative but they were too expensive. I noticed a need. READ Global is a pretty amazing organization that started by building and stocking libraries in remote rural villages of the world, and has expanded with the times to really personalize community services in the locations where they work. 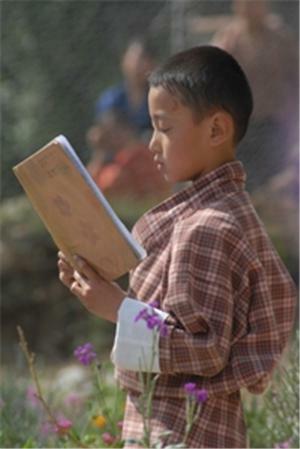 Places like Bhutan, India, and Nepal—Himalayan villages where education never had a fair shake, but is growing as a priority for the youth as materials and opportunities are provided where there parents and grandparents never had access. Rather than digest their carefully explained mission and goals, I’ll let their website text speak for itself–you’ll be inspired (hopefully to support them with a donation or with your volunteer work–perhaps even travel to and visit a READ Global project). Every month, 5 million people flee the poverty of rural villages and head for the city – to find work, to feed their families. The resulting urban overpopulation and squalor impacts all of us—through increased pollution and diminishing resources, the spread of disease, lack of clean water and safe food, and drained economic resources. These problems don’t know borders; they threaten the health of the global community and the strength of the global economy. Today we face a rural imperative: the urgent need to make rural villages places where families can thrive. The READ model partners for-profit business enterprises with non-profit Community Library and Resource Centers (READ Centers). This unique approach allows the local community to sustain the operations of the READ Center over the long-run while creating local jobs. Enterprise: READ Global works with community members to seed for-profit business enterprises that meet local needs, provide job opportunities and generate sustaining revenues for the READ Center. Education: READ Global works with communities to fund and build READ Centers that meet the unique needs of each village. These Centers provide access to books, computers, educational materials, job training, health services and workshops on leadership and conflict resolution. With these resources, individuals and families can learn, grow and reach their full potential. Prosperity: With a strong emphasis on both education and enterprise, the READ Global solution brings communities together to share ideas and build relationships that enable families and children to stay and thrive in their own communities. The READ model enhances rural capabilities, it does not replace them. We work closely and respectfully with local villagers to leverage their assets and talents to meet their specific educational, community, and employment needs. Villages contribute between 15%-40% of the total cost of the project along with land and labor and READ makes up the rest. This local ownership of such a community solution is essential to long-term success. This 30-minute PBS presentation is a small commitment of time to open your eyes wide and shine some light on a little known corner of the world. Mustang (pronounced Moo-Stahng) is variously known as the last kingdom and the lost kingdom of Tibet. 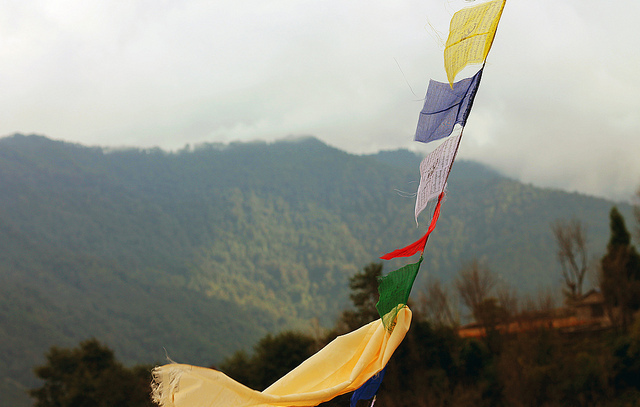 Once part of Tibet and later taken by Nepal, this tiny, isolated kingdom is, in many ways, the last, best hope for keeping Tibetan spiritual culture and traditions alive. In only a half-hour you are immersed in this world of intense color and music, like an island of saturated intensity amid the arid, bleak surroundings. Mustang is isolated in place (it takes five days by horse to get to the capital city, crossing windy, open plains and high mountain passes, some above 15,000 feet), and isolated in culture. It is a sanctuary of authentic Tibetan Buddhist tradition, Nepal first opened it’s southern border to outsiders in 1991, but traditions have lain fallow and neglect has taken hold. The once-glorious 15th-century monasteries began to collapse, the numbers of spiritually dedicated monks and caretakers dwindled, and sacred art and activity seemed poised to fall into dust. This documentary, in addition to sharing the people and place, also follows the efforts of restoration of the monasteries. 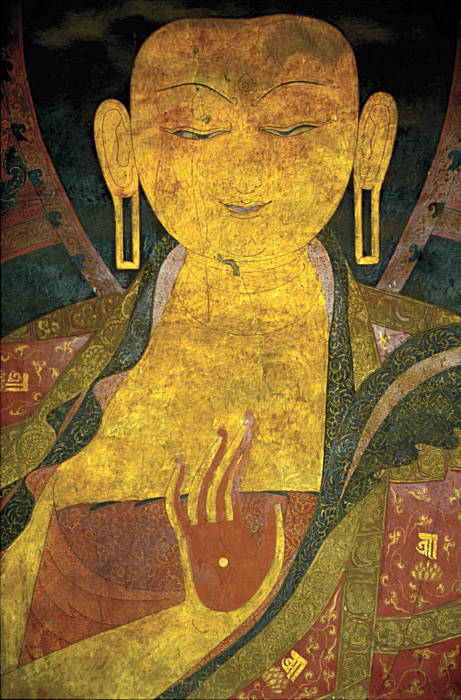 The freshly uncovered glory of the art that had been obscured by time is beautiful, as is the commitment of the King of Mustang who asserts that without cultural identity, there is nothing. The show wraps up right at the time you’d expect a commercial break (or pledge break, as the case may be…by the way, when was the last time you donated to support the absolutely necessary and vital work of PBS? Donate here.) It is narrated by Richard Gere, and is an appetizer-sized tease, stoking the fire of your desire to travel. 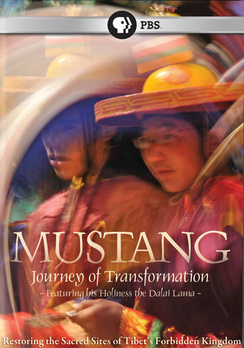 The DVD includes a special feature with video of the Tiji Dance Festival of Mustang.